The village of Scourie is set amidst spectacular scenery on the northwest coast of Scotland, an area renowned for its white sandy beaches, fishing, birdwatching and geology with excellent walking and cycling. 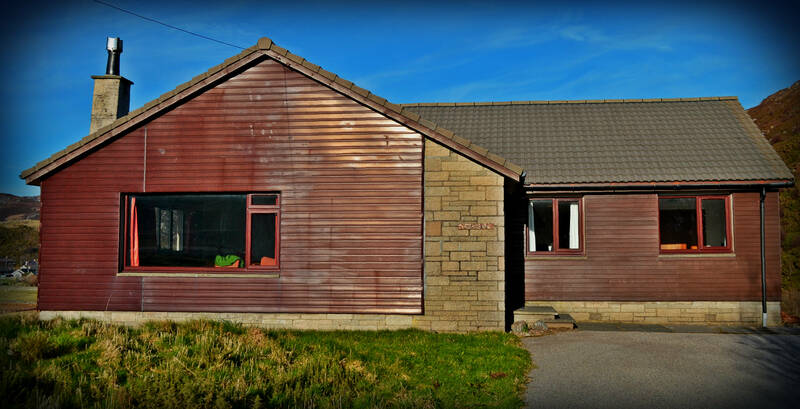 Cnoclochan is a comfortable, spacious L shaped bungalow sleeping 6/7 people having one double, one twin, one twin/double and a sofa bed. The house is set in an elevated position with panoramic views over the village and its crofts to surrounding hills and Handa Island. It has an enclosed garden and a small copse of native trees, besides the immaculately maintained (though infrequently used) football/shinty pitch and new children’s play area, a few minutes walk away. A footpath gives easy access from the house to Scourie beach and the village amenities (7 mins). Cnoclochan has a very large living room, with a table seating eight at one end, where the wall consists of a map of the north of Scotland made up of 1:50,000 OS map sheets. Wood can be bought locally for the open fire. The master bedroom has a double bed with en-suite power shower, washbasin and WC. The larger twin bedroom has two 2’6” beds which can be zipped together creating a king size bed. The third bedroom has two standard single beds. The spacious kitchen overlooking the village and surrounding crofts, has a wooden table seating 5/6. The utility room contains the washing machine, freezer and spare sink. The bathroom consists of a bath, separate shower, washbasin and WC. Football / shinty pitch plus children’s play area are available at the foot of Cnoclachan’s short driveway. Sorry, NO PETS are allowed. For availability and booking, click HERE.